As beautiful as spring on Long Island is, it can be a difficult time for those suffering from seasonal allergies. Although it may seem hard to believe, receiving regular chiropractic care can help boost the immune system – ultimately helping to relieve some of the nuisances of allergy symptoms. An allergic reaction occurs when the body overreacts to a natural substance it considers to be foreign. Although many of these triggers are generally not harmful, the immune system responds by producing histamines. For the majority of people, this overproduction results in symptoms such as dry eyes, a runny nose, and respiratory responses such as sneezing and coughing. The best way to battle allergies is to keep the immune system healthy and functioning at its greatest ability. When vertebrae are out of alignment – whether it’s caused by stress, illness, age, or injury – the nervous system is unable to reach its full potential. A chiropractor such as Dr. Todd Goldman works to remove subluxations (or misalignments in the spine) to boost the nervous system and keep the body healthy without the use of traditional medicine or prescription drugs to help you with your pain management. 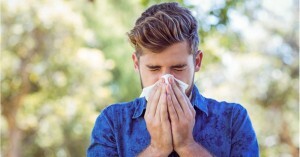 Although there are many prescription medications and over-the-counter treatment for allergies, these offer only temporary solutions and focus on treating the symptoms rather than the cause. Chiropractic care is founded on the belief that the body is capable of healing itself, and will do so assuming there is nothing prohibiting its natural function. Thus, when your nervous system is healed through chiropractic care your body can aptly respond to allergens and help facilitate an accurate allergic response that doesn’t cause any discomfort or negative consequences. At Total Chiropractic Care and Wellness in Medford, we are passionate about helping our patients reach their healthiest potential. Contact us today to learn about our outstanding staff, unique approach to treatment and the many services we offer. It will be the best decision you make this spring!